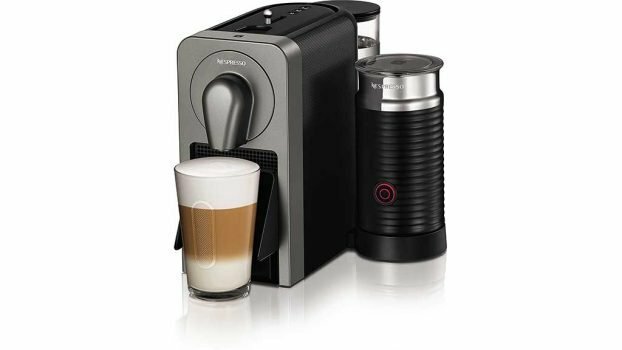 The Nespresso Krups Prodigio connected coffee machine that has a high price tag but makes it one of the best coffee machines around. The design of the Nespresso Krups Prodigio Capsule machine is one of beauty. The infamous Nespresso sleekness is most obvious with this machine. It looks like it is worth the £160 you’ll pay for it, although the only available colours are silver and titan. Additionally, its 37 x 32 x 27.4 cm measurements with a hidden power cable in the base of the machine means its footprint is minimal and will sit on any surface without too much disruption. See also Smeg ecF01 review. The best feature of this machine and what puts it at the top of the table for compact capsule machines is the size of the water tank. Many capsule machines are designed to be compact and unobtrusive on a kitchen bench. However, as a sacrifice, the water tanks are often small and need constant refilling per drink. The Nespresso Prodigio has a deceptive 800ml tank tucked at the back of the unit, meaning users can make several cups before refilling. As all capsule machines should be, the Nespresso Prodigio is incredibly easy to use. Where this machine rises to the top, however, is due to its versatility. First it three size buttons – ristretto (25ml), espresso (40ml) and lungo (110ml). Also, because you can use different sizes of cups with this machine, the amount of water dispensed can be programmed to be more or less. You can also top up your drink with hot water not long after your cup has poured. to be a coffee capsule and full water tank ready to go. Additionally, the Aeroccino milk frother (that comes as an added extra at £40) can’t be controlled by it. However, the smart functionality does have its benefits. For one, the app will notify you when you need more capsules of which you can order with a tap of a button. It also allows you to choose the size of cup you’d like. Its downfall is the Bluetooth connectivity – not WiFi. This has made pairing with devices difficult and means you can’t brew a cup on your commute home but are required to be within the vicinity of the machine. This does make the smart functionality relatively pointless, however, is one of the main contributors to the high price point. If you’re looking for the closest thing to a cafe-made, means-to-cup brew, you’ll find it with the Nespresso Prodigio. The quality of coffee this machine pours from a capsule is top grade. Brewed with Grand Cru capsules, every pour guarantees a good, thick crema and rich but smooth flavours. You won’t find bitter or watery coffee from this unit which, if high-quality coffee is what you’re looking for, could justify the high price tag. As mentioned, at an added cost, you can upgrade the Nespresso Prodigio to include an Aeroccino milk frother. It does only make enough milk for one cup (or two at a stretch) before you need to hand wash it but if you’re partial to a cappuccino then the Aeroccino is definitely worth the added cost. However, if all you need is a bit of hot milk in your coffee, a mug in a microwave should do the trick. The Nespresso Prodigio also excels in pouring hot coffee. Often capsule coffee machines struggle to get the temperature of the coffee up to a barista standard, but the Nespresso Prodigio doesn’t seem to struggle with that. Only taking 25 seconds to heat 800mls of cold water shows how much effort the product designers put into ensuring it could pour a good, hot coffee every time. £160 is no doubt the upper end of the scale for what people pay for capsule coffee machines. And with its price hiked by an unnecessary smart gimmick, it’s a lot to pay. However, some would say worth it for the incredibly good coffee it makes. The design, brand and quality of coffee make the Nespresso Prodigio one of the best capsule coffee machines on the market. Its designers have obviously found what was lacking from other units, mainly versatility and a bigger water tank, however even that still makes the £160 hard to justify. Take out the unnecessary smart functionality and you could be looking at a £99 unit that would be worth every penny. Check today’s best prices on Amazon.